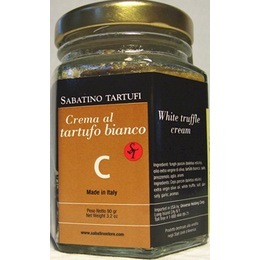 White Truffle Cream 3.2 oz. Imported from Italy. Crema al tartufo bianco: Ingredients: Funghi Porcini (boletus edulis), Extra Virgin Olive Oil, White Truffle, Salt, Parsley, Garlic & Aromas. Uses: Any dish that would benefit from this flavorful sauce such as pasta dishes, spreads, risotto, fish, meat dishes or vegetables.